Unsure how you are going to plan a wedding on a budget? Join the rest of the country. 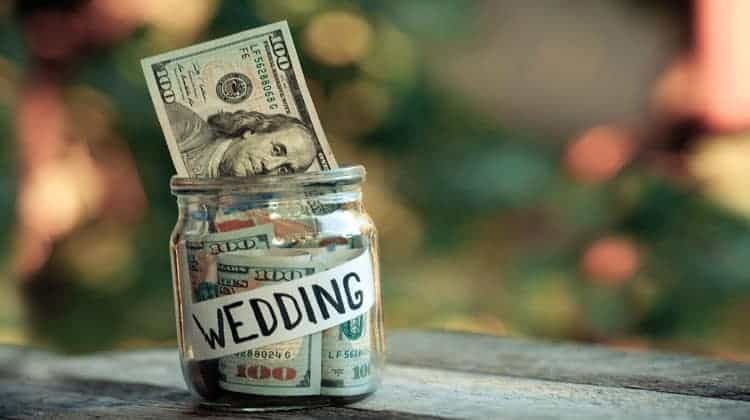 While we may intend to keep spending under control, data from The Wedding Report, Inc suggests that Americans will spend an average of $28,000 per wedding in 2019. This follows a gradual uptick in spending year over year since 2013. You can buck the trends and still have a wedding day that you’ll treasure for years to come. We have wedding tips that keep expenses down and enjoyment high while keeping your sanity in check. A reduction in costs in one area could help you stay under budget and leave money for other financial goals such as a down payment on a home, emergency fund, paying off student loans, or a dream honeymoon. Incorporate one or more of these inexpensive wedding ideas into your DIY wedding, and you’ll look like a creative genius and have money left over to boot! Ever look at the price tag of some wedding dresses? Yikes! They can easily eat up most of your wedding budget. Use these tricks to save a serious amount of money on wedding dresses. Not to mention it will give you more time to save up a little bit more cash and avoid going into debt. That dress that you’ve been eyeing for months just won’t go on sale. It’s time to talk to the salesperson about their sales cycle. Be sure to check their written policy on honoring price drops. It might be okay to go ahead and purchase the dress today and snag that discount in the future. Or, see if they offer a discount if you pay in cash. You never know unless you ask! Your wedding theme can downplay the need for a lace wedding dress with a train. Think country, whimsical or vintage. Remember it is your day. Go with what you like and fits your theme, not with what others expect you should wear. Buy or rent your wedding dress from a secondhand retailer. Check out local resale shops for last year’s “It” gown. If the dress you’ve been coveting isn’t available, keep looking. You’re sure to find a cheap wedding dress that meets your needs at a secondhand store. The dress will most likely need adjustments. Even with a new dress, alterations are to be expected. Consignment shops that cater to brides are popping up across the country. Do a quick Google search for one in your area. Consider alternative colors. Off-white, shell, blush or even light pastels make beautiful wedding dresses. Again, think about your wedding theme and your perfect wedding dress color will reveal itself. It’s hard to talk wedding decorations in isolation from the wedding venue. One will most definitely influence the other. We suggest beginning with the venue. Choosing smart here reduces the need for extravagant decorations in the first place. Here are the best options for cheap wedding venues and cheap wedding decorations. Wedding venues are often seen as one of the most significant expenses when holding a wedding, so go nontraditional on venue and save big bucks. Consider botanical gardens, summer camps, public parks, or your friend’s backyard. Heck, think about renting an Airbnb! Regardless of your final selection, be sure to ask for pay-in-full discounts. Many businesses live and die by their status on social media and offline reputation. They are always looking for good, honest feedback to help garner more business. Offer to leave an honest review on Yelp (or their site of choice) for a 10% discount. The same can be said for referrals. Bargain for a discount based on the number of referrals who book business with them within 60 days of signing your contract. Have a standing wedding ceremony. You can significantly reduce costs by keeping the wedding brief with a standing ceremony and only securing enough chairs for elderly attendees. And to be honest, many people will appreciate a shorter service that is unique rather than the traditional type of wedding. Subscribe to every vendor e-communication that you are even remotely considering. This is how you can receive notification of unpublicized discounts. However, be careful. Your inbox will be flooded with offers. We suggest opening a separate email account to handle the onslaught of promotional materials you’re bound to receive. Another option is to follow the vendor on Facebook or other social media platform. They may post discounts to their followers via these means. When family and friends ask, “How can I help with your wedding?” let them know that food will be served family style. Have everyone bring a side dish or make it BYOB as a way to limit your expenses. Many people will love this idea and it will save you money and time. You won’t have to go and sample the food beforehand to pick what you want on your wedding day. Tap your local university or community college for talent. The fine arts department is bound to have a talented harpist, acoustic guitar player, or pianist that’ll meet your needs. Students in their last year of study will most likely charge less than a professional musician and offer the most value. Wedding rings are another area that can quickly destroy any well put together wedding budget. Use these tips to help keep the cost of wedding rings in check. Not sure how to budget for wedding rings? Keep in mind that beautiful wedding rings in excellent condition can be found at pawnshops, consignment stores and estate sales at substantial discounts. Concerned about not getting a matching set? Make a few phone calls. If they don’t have what you’re looking for today, mark your calendar to check back every two weeks. Sellers have inventory which changes on at least a weekly basis. There’s no need to rush your final ring selection. Grooms should select a basic wedding band now with the intention of springing for a nicer ring by the second wedding anniversary. This will allow time to save for your wedding ring of choice and remove the pressure and expense of buying the perfect ring right now. Amazon has a wide selection of men’s wedding rings under $50. Can you tell the difference between a platinum wedding ring and one made of white gold? Neither can most people. They have the same aesthetic appeal, but the cost of platinum makes white gold the better choice when planning a wedding on a budget. Eyeballing a perfectly colorless or perfect clarity diamond? You can buy a near perfect diamond for much less, and the naked eye won’t be able to tell the difference. In other words, save some money by choosing a near perfect diamond. No one will know it isn’t flawless and you will save nice chunk of money. Purchase diamond wedding rings that are just below the whole and half carat weight marks. The act of “buying shy” can save you up to 15%. For example, instead of buying a 1-carat diamond, buy a 0.97-carat diamond. Unless your guests are inspecting your ring with a jeweler’s loupe, they will never know you decided to buy shy. Wedding flowers shouldn’t make up a large portion of your budget. But they can be expensive. There are handful of ways to get wedding flowers on a budget. Here are some of our favorites. An easy way to save cash on wedding flowers is to use the same flowers from the ceremony at the reception. This one is a no-brainer. It will take some planning ahead to get them all moved over to the new location, but you will save money in the process. Turn the bridesmaid’s bouquets into a large centerpiece at the cake table. Use more greenery than flowers in the wedding decor. It costs less than flowers and still adds to the event. Do you find yourself touching silk floral arrangements even though you know they’re fake? That’s a good thing. Use silk flowers as guest table centerpieces and save a ton of dough. Skip the wedding flowers and rent tall, white candelabras. This nontraditional move provides a dramatic effect your guests will remember. Getting professionally made wedding invitations is a waste of money. Most people toss them right away. Save some money by using the tips below on wedding invitations. Then use the saved money on more important aspects of your wedding. Use a service like Evite or Punchbowl to send your wedding invitations and manage RSVPs online. You’ll save on the invitations and cost of stamps. Plus it will be a lot easier to keep your guest list organized. To save even more money on cheap wedding invitations, buy online using Ebates. You’ll earn cash back for the purchase and still get to use coupons! #24. Where Can I Get A Sample Wedding Budget? Make use of free, online planning tools to put together a wedding budget. The Knot offers an online tool for the tech-savvy. If you like to go old-school style, Real Simple offers a printable basic budget worksheet with suggested budgetary allocations. The point is to use a budget and don’t spend a dime until you and your partner have agreed on a wedding budget. Here are a few more tips to help get you thinking of ways to throw a wedding on a budget. By simply thinking outside the box, you can save yourself a lot of money. Here are our 5 favorite inexpensive wedding ideas. Opt for a Friday evening wedding. Sunday works as well. Stay away from a Saturday booking, which is the most popular day to have a wedding, and you’re sure to save some cash. Regardless of your wedding theme, give serious thought to serving a wedding cake alternative to your guests. For example, apple pie for a country theme or a simple dessert buffet that includes brownies, cookies and chocolate covered strawberries for a vintage theme. Take it one step further. Have a food truck that serves only cupcakes for dessert. Have a morning wedding. Being an early riser can pay off in more ways than one. In addition to possible discounts for being the first event of the day, a morning wedding that’s held outdoors often provides the perfect amount of natural light for photographs. A morning wedding can also mean a breakfast buffet. Breakfast potlucks are significantly less expensive than plated dinners of chicken, beef, or fish. Try to snag a winter month that’s not December. So, November, January, February or March are your best bets. The most popular month for winter weddings is December. The most popular is often the most expensive. Here is how Jon and his wife had an amazing wedding for a fraction of what most people pay. Use these wedding tips to your advantage. Figure out what is most important to you. For Jon and his wife, it was the music and the food. These were the two areas they spent the majority of their wedding budget. Don’t bother decorating. People won’t remember the centerpieces or other decorations. So use cheap wedding decorations or no decorations at all to save a lot of money. Jon and his wife didn’t use centerpieces and they used minimal decorations. Most were from Michael’s using coupons. Don’t overspend on the venue. Same idea here as with decorations. Just find a location that is suitable for your needs. You don’t need amazing here, just a place that will comfortably allow you and your guests to have a good time. Find the best place for flowers. Jon and his wife bought flowers at Produce Junction, where you can buy a large quantity for much less money than a florist. Think about the wedding dress. You might think that the wedding dress is critical, but it is really? You will only wear it once and it will get dirty (and possibly torn) as you walk around, take pictures, dance, get in and out of cars, etc. Jon and his wife saved thousands by going to a second hand store to buy the wedding dress. No one knew it wasn’t brand new and his wife looked incredible. In total, they had a great wedding that people still talk about today. And that makes Jon and his wife happy as they wanted to have a great wedding where everyone had an awesome time. You can have a dream wedding on a budget with a bit of planning and using these wedding tips we outlined. Know your budget before you spend a dime. Once you have your upper spending limit set, break the funds into percentages based on what’s most important. Compromise on quantity, not quality. If you must have a new dress, then be prepared to make compromises when it comes to the venue. Regardless of how much money you have to spend on your wedding, don’t expect perfection. After all aren’t our most treasured, memorable moments found in life’s imperfections? Tracy Scott is a freelance content marketing writer who specializes in personal finance and higher education. She is a regular contributor at Earn It Save It where she loves writing about new ways for people to earn and save money online.